Legalize the sale and use of marijuana. Allow stores to sell liquor. Repeal the tobacco age increase. We believe that adults have the right to use recreational drugs such as alcohol, tobacco, and marijuana. We don’t advocate using those drugs, and of course we recognize that there can be drawbacks to using them. A number of states are already permitting the sale and use of marijuana, and Virginia should join them. Legalizing marijuana has already had significant benefits, including lower black market activity and positive economic effects. Marijuana arrests have dropped more than 90% in Colorado. The trend has even had benefits at the national level: according to the LA Times, marijuana seizures at U.S. ports have dropped from 2.4 million pounds in 2013 to 861,000 pounds in 2017. Virginia should become part of this solution. Unfortunately, a 2019 bill in the General Assembly to decriminalize marijuana (i.e., reduce the penalties) did not even make it out of committee. We need legislators who are more enlightened on this issue. Currently, the state of Virginia has a monopoly on liquor sales, the Virginia ABC. That’s ridiculous. Private storeowners should be able to sell liquor, just like they can sell anything else. Government monopolies are basically concealed taxation. Instead of allowing Virginians to make profits from liquor sales, the state captures that money for itself. And like most monopolies, The Virginia ABC tends to charge higher prices than you would find in a free market. 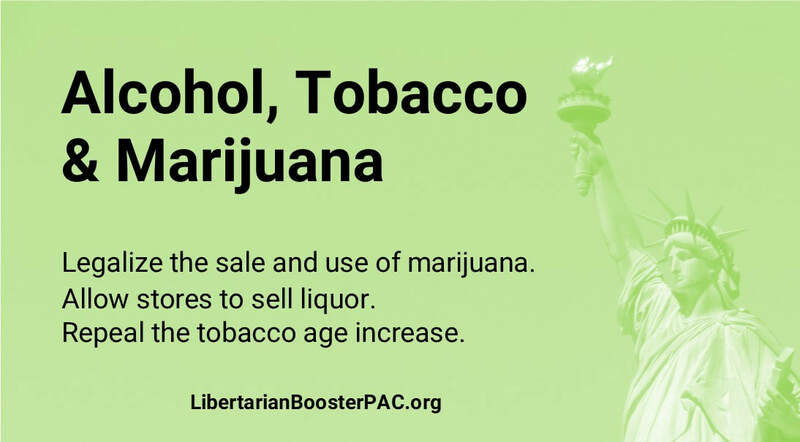 We support legalizing liquor sales and eliminating the Virginia ABC. Private businesses are allowed to sell beer and wine, but unfortunately, in 2018 the General Assembly passed a law to increase their licensing fees. We think these licensing fees should be cut or eliminated, not increased. In 2019, the General Assembly raised the legal age to buy or use tobacco to 21. This is simply a violation of the rights of young adults. We want to repeal this increase. Everyone knows that smoking can be harmful to your health. We believe that adults have the right to make choices about what to consume, even when those choices may be harmful to their health. In 2019, Senate Bill 997 and House Bill 2079 to decriminalize marijuana both died in committee. In 2018, the General Assembly passed Senate Bill 884 to increase the licensing fees for businesses that sell alcohol. In 2019, the General Assembly passed House Bill 2748 to raise the tobacco age to 21.